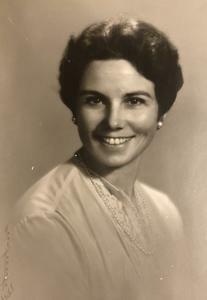 Mrs. Nancy H. "Kim" Farmer, age 88, passed away Tuesday, April 17, 2018. She was born in Chicago, Illinois on March 22, 1930 to Joseph & Mildred (Kanagy) Harrington and married Judge Edward "Cam" Farmer Jr. on September 24, 1955. Mrs. Farmer had been the Owner and Travel Agent of Gallery Tours for 35 years until retiring. Kim was a water safety instructor for many years. She served for the American Red Cross in Tokyo Japan and was a life long volunteer for many causes. Kim enjoyed traveling, reading, knitting, cooking and sports, especially swimming, skiing and sailing. She will be greatly missed. Daughters, Betsy (Ken) Sommer, Alice Farmer; sons, Michael (Aileen) Farmer, David (Phoebe) Farmer; grandson, James; sister, Dorie Sampson. She was preceded in death by her parents; husband, Judge Edward "Cam" Farmer Jr. & sister, Alice Primrose. According to her wishes, private family services were held. MEMORIAL: Leukemia and Lymphoma Society or Easter Seals of Michigan.